Kits are not available for this article . . . There are many ways to achieve motion, from linear motors, pancake motors and even micro-motors the size of a pinhead. A linear motor is the name given to the motor found on a mono-rail train. It has no wheels and the train is lifted above the track via magnetic repulsion - also called levitation. A pancake motor is found in car door winders where the space is limited to a very flat type of motor. They are also used in computers to rotate CD's and hard discs. They also have the name "stepper motor." 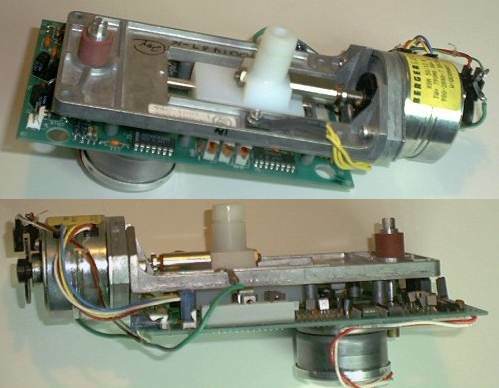 Here is a recent invention called a "Gemini Electric Motor." It uses both ends of an electromagnet to produce more torque than a conventional motor. It is also called a pancake motor as it can be made very flat. 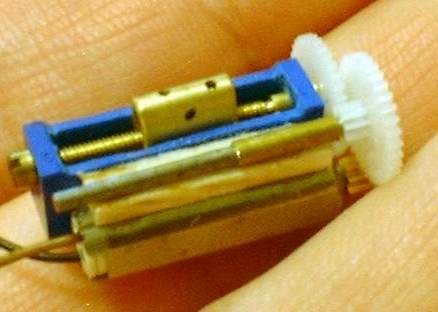 Here is a cut-away view of the construction of a micro motor. It is hard to see the actual design but the armature consists of 3 coils of wire wound nearly over each other and dipped in resin to seal them and make them stiff. This hollow tube of windings is then placed over a magnet and is free to spin over the magnet. Normally the magnets of a 3-pole motor are on the outside. For this motor, the magnet is in the middle. This is a much-better idea as the torque that comes from the coil is at the greatest distance from the shaft and the motor is no larger than the coil itself. This is a brilliant concept. The ends of the coils are terminated at a flat-looking commutator exactly like the normal commutator for a 3-pole motor but on a disk to take up less space. There are also dozens of other types of specialised motors, designed for low RPM, high torque, (such as a starter motor in a car), constant speed (such as a clock motor) and many other requirements. But sometimes linear motion needs to be produced via some other means and a solenoid will produce this. This is the main topic of this discussion. There are lots of problems with producing motion via a solenoid as this type of activation is both inefficient and difficult to control. It is difficult to control the speed with which the motion occurs and the operation requires more energy than using a motor and threaded rod or a crank, for example. 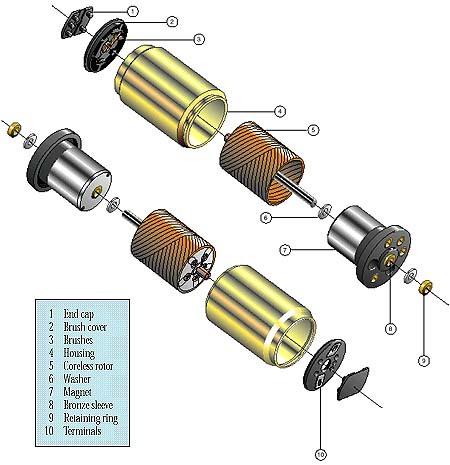 But a solenoid is low-cost and can be very compact and thus it has a number of applications. For the hobbyist, it is most difficult to get the components as very few devices are available and nothing has reached the second-hand market. Thus we have to be very enterprising and keep on the "look-out." Recently, the author found a small solenoid in a birthday card. It activated an arm and this moved a cartoon character to produce animation. Some toy cars also have a rotational activator to produce steering to the front wheels. This is called a "rotary solenoid" or "rotary actuator." A solenoid can provide a force in both the push and pull direction, simply by reversing the polarity of the supply. This is just like the forward and reverse direction of a motor. The other fact to remember is the strength of the "pull" or "push." When the core is fully outside the winding the pull is very small. As the core is brought into the winding, the pull increases, even though the current flow does not change. This is because the core interacts with more of the flux. When the core is fully contained within the winding, the pull decreases to zero. Thus the movement (or throw, or activation) is within these two limits and the strength of the pull increases to a maximum at the middle of the "throw" and decreases to zero at the end of the throw. The force or pull, provided by a solenoid is determined by the number of turns on the winding, the current flowing and the core material. If the core is a strong permanent magnet, the solenoid will operate in both a push and pull direction. If the core is soft-iron, the solenoid will operate on AC and provide either a push or pull force and the core must be returned to its original position via gravity or a spring. For an AC actuator, the core will pull into the winding when power is applied. The simplest solenoid has a few hundred turns wound on a cardboard tube and connected to a battery. If a nail is placed near the end of the solenoid and the battery is connected, the nail will jump up into the winding and remain there. This is where the "pull" on the nail is zero (actually where the push and pull forces are equal) and if the nail is moved to either end of the winding, it will be returned to the centre by the magnetic force produced by the current through the winding. When the supply is removed, the nail will fall. These are the basics you need to know when designing an actuator. The actual pull delivered by an actuator depends on many things and one of the variables is the number of turns. Increasing the number of turns will increase the "pull," but this will increase the resistance of the winding and thus less current will flow, if the voltage remains constant. Thus, to increase the "pull," the thickness of the wire must be increased so the resistance of the winding does not increase and you can take advantage of the extra turns. If the core is a magnet, the strength of the "pull" will depend on the strength of the magnet and how tightly it fits down the centre of the winding. Rather than provide lots of formulae and winding details, it is best to buy a ready-made solenoid and see how it performs. One of the smallest solenoids is available in a birthday card. It is activated by a chip (actually a Chip On Board - COB module) using driver transistors. It pushes and pulls a cartoon character to provide the effect of dancing, while the chip produces music at the same time. Driving a solenoid is not easy, especially if you want to drive it in push-pull mode. The basic circuit is called an "H-Bridge." Solar Tracker-1 employs an H-bridge to drive a motor forward and reverse. The motor can be replaced with a solenoid. This is the distance you want something moved. You may need to move something in a straight line or rotate something. Examples such as moving something to reach another item or push an object a certain distance or rotate something such as a door or gate. When an item is being rotated, or moved through an arc, the actuator is attached to the gate etc at a point near the hinge and the gate is moved from the closed to open position. The TRAVEL is then determined. The actuator must provide this TRAVEL. This is the distance from the "closed" to "open" position of the actuator. If the actuator will not provide this amount of travel, a position closer to the hinge of the gate is selected. As you move closer to the hinge, the effort required to move the gate is increased. The EFFORT, or STRENGTH, or FORCE or of the actuator. The strength of an actuator is measured in gm-cm, or foot-pounds. This means it will push or pull a certain number of grams a certain number of centimetres. It is not GRAMS PER CM, but grams multiplied by centimetres. When working out the effort to open or close a gate, you need to take into account the fact that the "pull" required will be much greater at one end of the activation. To make yourself aware of this, take a length of cotton, tie it to the gate and pull the gate open. You will find it takes a strong "pulling-force" to get the gate to move initially and the cotton may break. This is where the greatest force is required. You may need to perform a certain action in a certain number of seconds. This is called the SPEED of ACTIVATION. This must also be taken into account in some applications. 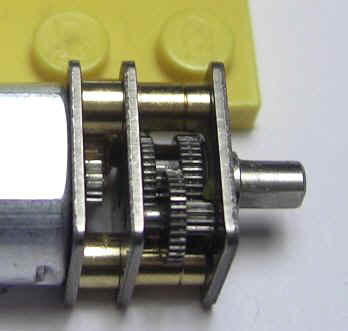 If you cannot get the required distance or force, an actuator can be connected to a LEVER. A lever can increase or decrease the TRAVEL or FORCE of an actuator. There are three types of LEVERS called "Classes of Levers." Class-1 is the "see-saw" with the fulcrum between the load and the effort. There is no mechanical advantage with this class of lever. It is purely to create movement at a distance from the actuator (or create push instead of pull). Class-2 lever, such as a "wheelbarrow" always has a mechanical advantage greater than 1. The actuator can move a larger load but the travel is not as far. load is greater, but the load moves a greater distance than the actuator. Levers can be used to a great advantage with actuators. They can create the exact amount of travel required or increase the force. Unfortunately, you cannot increase both the force and distance at the same time. If you increase the distance, the load cannot be as large. Levers can also increase or decrease the speed of movement. Simply playing with sticks and pins or Lego will help you understand the type of lever you require. In general, linear actuators are expensive to purchase and have a high rate of wear. They are also expensive to operate. For this reason you must determine if the application can be done with some other form of activation. In recent times, a lot of different types of actuators have come on the market and there is a wide range to chose from. This has just been a starting point to help you decide if a solenoid is the best way to produce linear motion.